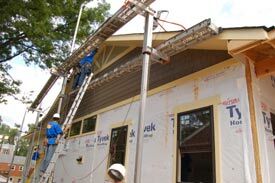 Lakeside Exteriors were honored to have been contributing members of the ABC Network TV show Extreme Home Makeover! View the Makeover projects below. 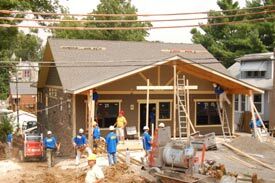 ABC Network TV selected the Sam’s Coffee House, Manchester, MO for a fall 2008 complete home project. 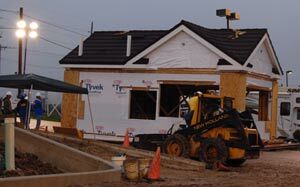 The project was completed during the 1st week in September 2008. The presentation was made to Sam in an emotional gathering on September 9, 2008. 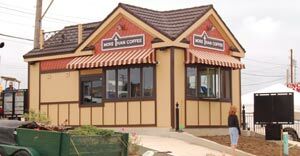 Lakeside Exteriors, Inc. installed the James Hardie siding and other exterior components on the Coffee House. Approximately 15 employees volunteered their time and services. Approximately 1200 square feet of siding and 600 linear feet of trim was installed (excluding the soffit, fascia and overhang components). 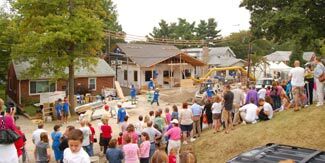 Matt and Dan Merrifield and the employees of Lakeside Exteriors were honored to have been contributing members of the Extreme Home Makeover St. Louis and in particular it was a pleasure being of service to Sam. We are sure he will enjoy his new business facility and wish the very best success. ABC Network TV selected the Martirez family, Shrewsbury, St. Louis County, MO for a fall 2008 complete home project. In September 2008 the Martirez family was given a one-week vacation to Disney World – during that time their small home was demolished and a new home, designed to accommodate their two disabled children was erected and exquisitely furnished. Upon their return from their vacation, they were shown their new home in a very emotional gathering. Approximately 3000 square feet of siding and 1200 linear feet of trim was installed (excluding the soffit, fascia and porch components). 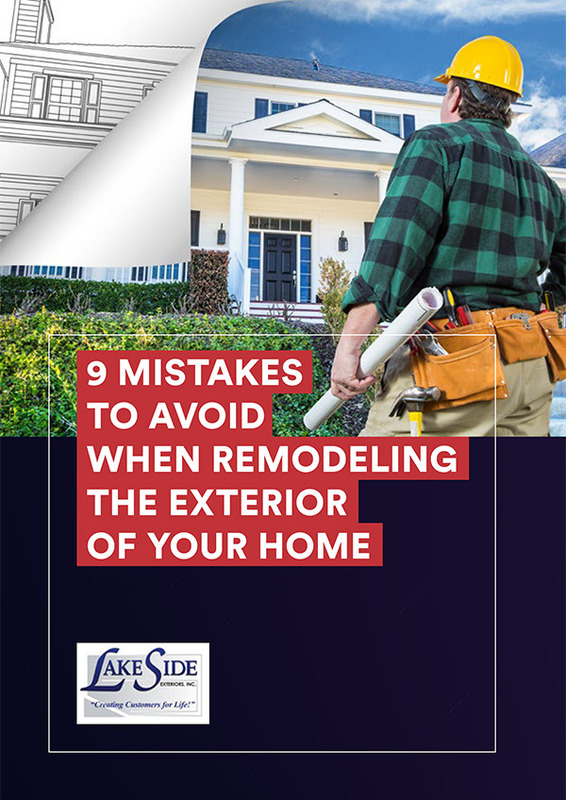 Matt and Dan Merrifield and the employees of Lakeside Exteriors were honored to have been contributing members of the Extreme Home Makeover St. Louis and in particular it was a pleasure being of service to the Martirez family. We are sure they will enjoy their new home and wish the very best future for the Martirez family.